The Henderson Bridge on the Providence/East Providence line just got the green light for demo and reconstruction. It will shrink from 6 to 2 lanes, officially killing the dream of the past that a highway would run through there! It may have been built as a 6-laner; but only 4 lanes have been open for quite some time. Nice sky color in that first sign, mergingtraffic! Thanks Shadyjay and Jon! Sometimes I wonder if people actually like the pics I take. The scattershot button copy reflections are a nice effect too. Every sign replacement project always seems to have that one sign that got away... that missed the cut... that was either at one extreme end or the other of a replacement contract that it just got overlooked. Well this seems to be the perfect example of this. It looks very much like a Rhode Island sign, but its in Massachusetts, a mile or so before the border. And my thought is that it got missed out by not just one, but two sign replacement projects. A similar thing has occured with RI Exit 30, being practically on the Mass. border. More uniqueness... the Mile/Km distances to two control cities that don't even appear on any exit signs down the line. Any thoughts on this rogue unit? Typically, the limit of work for sign replacement projects only goes as far as the state line. Any signs beyond the border are not included and are the responsibility of the adjacent state DOT agency (MassDOT in this case). Unless RIDOT notified MassDOT during the design phase of the project that one or two of their signs referencing RI interchanges needing to be replaced/updated; such are usually left alone. The above-example BTW is 1 mile from the border. Actually, that Valley Falls / Diamond Hill mileage sign was replaced in both of the last sign replacement projects. I used to travel that route regularly and clearly remember the previous versions. For some reason, it is always replaced identical to the previous one, and never changed to the more current format MA uses for mileage signs or to remove the km distances. Follow up: is this the only remaining sign in MA with mile and km distances? 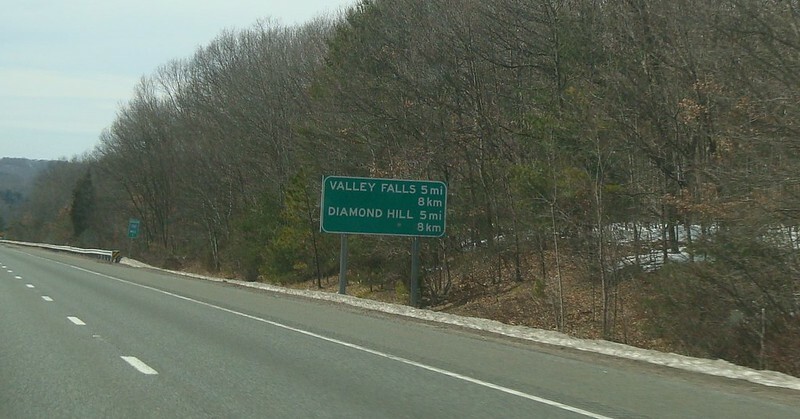 Actually, that Valley Falls / Diamond Hill mileage sign was replaced in both of the last sign replacement projects. I'm assuming that those sign replacement projects you're referring to were MA projects and only covered the short MA stretch of I-295. 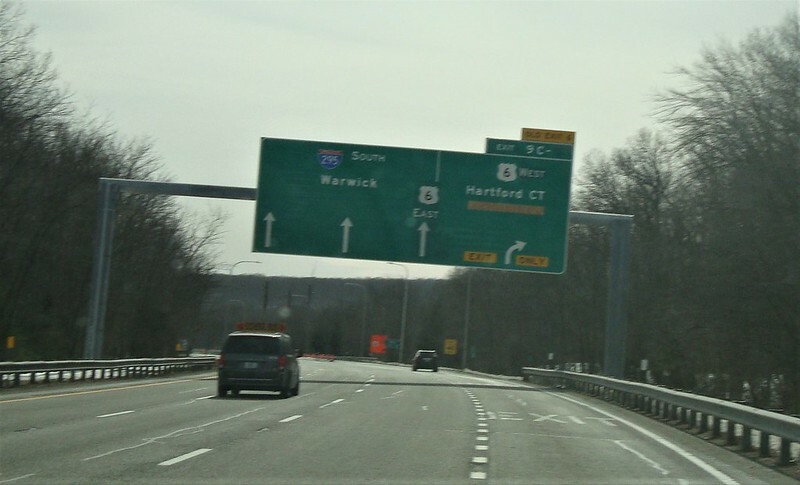 The replacement signs along the RI stretch were separate/independent RIDOT project(s). I used to travel that route regularly and clearly remember the previous versions. For some reason, it is always replaced identical to the previous one, and never changed to the more current format MA uses for mileage signs or to remove the km distances. That is odd to be sure. MA's first mileage BGS' that showed km distances were from the mid-1970s. 95SB in Providence gas a couple as well. I've got shots of those on my I95 RI page on Flickr. Yes, they were replaced by MA as part of their sign contracts. This has always been a MA sign, it never matched the style of any of the BGSs on the RI side of the line. There has been an APL on I-95 SB in Providence for the US 6/RI 10/Downtown exit for at least a couple years. It would've been a smarter idea to erect this APL AFTER the bridge repair. However, it's RIDOT...so I shouldn't be surprised. Wrong. The 'Valley Falls/Diamond Hill' distance sign with the dual MI/km distances is done to RI spec, not MA. This sign was retained during both the 1988 MassDPW and 2005 MassHighway I-295 sign replacement projects. As the sign is located in MA, I'm not sure how it got there to begin with.